In cases where pollutants have low vapor pressures, condensation is effective for removing a significant part of the vapor. The condenser works by cooling the feed gas to a temperature below the dew point of the feed gas. Although condensation can also occur by increasing the pressure without changing the temperature, this method is seldom used for the control of air pollution. Because condensation is a simple process and the design techniques for condensers are well-established, condensation is also used as a pretreatment process for reducing the load and operating problems of other pollution control devices. Cooling water is the most commonly used coolant although brine solutions are also used when low temperatures are required. Two types of condensers are surface and contact condensers. Surface condensers are used when the coolant and pollutant form a miscible mixture. This mixture must be further separated (e.g., by distillation) for recovery of the pollutants. If the coolant is immiscible with the pollutants, contact condensers are used because phase separation is a relatively easy operation. However, the coolant is not contaminated to the extent of causing water pollution problems. Contact condensers are much smaller and less expensive than surface condensers. 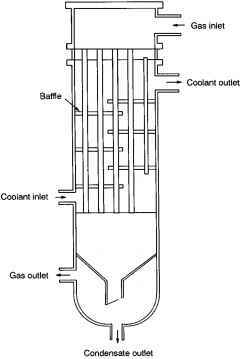 In the design shown in Figure 5.20.9, part of the coolant is sprayed into the gas space near the top of the condenser. This design is similar to the spray column used in absorption. The remainder of the coolant is directed into a discharge throat to complete the condensation. The pressure regain in the downstream cone of the venturi is often sufficient to eliminate the need for a pump or a barometric leg. Because the coolant required to operate contact condensers is ten to twenty times that for surface condensers, the latter is the predominate device used in air pollution control applications. The design of a surface condenser is based on complete resistance to heat transfer on the condensing side in the layer of condensate. A mean condensing coefficient is calculated from appropriate correlations. Calculating the overall heat transfer coefficient and the log-mean temperature driving force estimates the required heat transfer area. Many engineering textbooks (Perry and Green 1984) provide additional design details.